In violation of one of the cardinal rules of theatergoing, smartphones should be left on at Privacy, the new play that examines the effects that the Internet and its apparatuses have had on our everyday lives. But the phones, which audience members are asked to silence and keep within an arm’s length, are not the only distraction at this entertaining, but less than impactful, play. 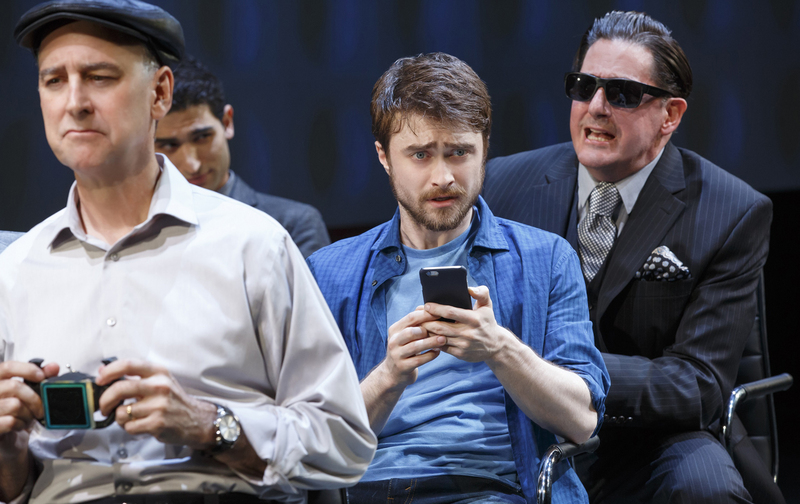 As the play opens, we are first introduced to its protagonist, known to us as The Writer and played with self-effacing charm by Daniel Radcliffe. Having recently ended a relationship, he is seeing a therapist, which proves to be more of a challenge than one might expect, as he finds it almost impossible to talk about his feelings or, really, share any aspects of his personal life. When discussing his relationship with his new doctor, Josh Cohen (Reg Rogers), he will not reveal the gender of his former partner, employing the gender-neutral pronoun of “they.” And, we learn, they broke up with The Writer because he was so closed off from in-person interaction, instead finding himself “hyperlinking through life” and falling down the rabbit holes of the Internet. Reflective of the short attention span supposedly developed by Internet activity, the atmosphere of Privacy, which is directed by Josie Rourke, shifts swiftly, staged on Lucy Osborne’s versatile and modern sets, enhanced by Richard Howell’s lighting. The first act of Privacy explores personal realms of the Internet such as e-mail, Instagram, Facebook, and online shopping, and the second act turns to government surveillance and the intrusions on those realms. Security measures and monitoring programs that were enacted after the 9/11 attacks, such as the Patriot Act, Optic Nerve, and PRISM, are explained to the audience through a series of vignettes, including an impromptu interrogation of The Writer by an NSA agent—based on “reasonable grounds,” of course. While extremely informative, the second act’s script more resembles a series of PowerPoint presentations and improvised skits than a continuance of The Writer’s story, causing the narrative that had begun during the first act to slacken. A presentation about how little privacy we actually possess and how the government justifies (or doesn’t) this surveillance is certainly useful for any citizen, especially during the heightened dialogue of the presidential campaign. But the shift in tone from a character-driven story to a seminar on smartphones and security was unexpected and, at times, frustrating. Without the emotions of the characters at stake, the script drags. The second act of Privacy inspires little investment from the audience. Indeed, after the interactive portions of Privacy had concluded and the lights were dimmed, many audience members kept their phones out, seeming to be sending text messages and e-mails. And even more people talked throughout the production, providing more of a distraction than the phone screens. Perhaps the play’s basic contrivances make this more likely. One might also guess that the audience was just bored. Carey PurcellCarey Purcell is a New York-based writer, reporter, and theater critic who writes from a feminist perspective. She has written for The New Yorker, American Theatre, Bust, Playbill, and HowlRound.